The bottle water filling machine is a fully automatic monobloc for bottle washing, bottle filling and bottle capping, with wide flexibility for all kinds of non-carbonated soft drinks, such as fruit juice, detergent, oil, vinegar, wine, mineral water and pure water. 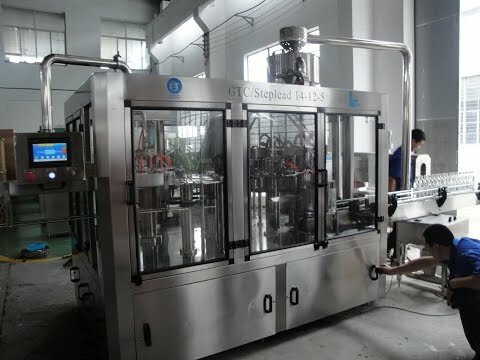 It is the most popular filling equipment in soft drink industry. •Air conveyor, star-wheel work synchronously together for the bottles infeed, compatible bottle volumes ranges from 200ml-2500ml. •With rotary washing system, new bottles enter into the equipment by star wheels, through grippers and overturning system to turn bottles upside down during flushing, and overturn bottles up automatically and convey to the filling sytem by star steels for filling, the main material and washing clip is stainless steel. We choose only world famous or trustable suppliers for all electric components, including Japanese Mitsubishi, Omron, German Festo or Taiwan Airtac pneumatic parts, Japanese ABB motors etc. •Super anti-corrosion stainless steel, and there is bottle blocking protection device for all wheels. •Japan Mitsubishi PLC controlling system with touch screen control panel. •For all liquid contact parts, we adopt only food grade raw materials for them, including filling heads, storage tank, rinsing head, capping heads ect. •Heat-proofing rubber is used for sealing parts, to meeting the high temperature standard for sterilization purpose. With PLC controller to achieve fully automation performance from bottles feeding in and feeding out, speed regulator adopts transducer, then different production speed would be adjusted as per client’s different needs. •To assure beverage quality stable, equal pressure filling principle and current spring valve are adopted. •Italy AROL capping technology is adopted for perfect capping quality, with advanced magnetic coupler to regulate cap-screwing torque. •The gravity liquid level fixed filling technology is adopted. •Spring grippers are used for bottle washing system. The empty bottles would be turned over 180° along the conveying rail for thoroughly bottle flushing and dripping dry. •Twice rinsings for bottle internal and bottle external . •The screw capping system adopts magnetic torque technology. •The power of screw capping can be controlled steplessly. •Well protection for capping, the power of the screw capping can be fixed to avoid any damage of caps. •The amount of the drinks in the storage tank can be controlled with CVT. •Bottle sensor is adopted, filing and capping will stop automatically when no bottles conveying. •Caps sensor is adopted, when errors happen, including capping wrongly or short of caps, the capping system can be stopped automatically and immediately. •The production capacity can be read on the touch screen panel and can be controlled very easily. •Automatic photo-electricity detection and automatic break-down when error happens.